BACKGROUND AND PURPOSE: MR imaging findings of cerebellar cortical dysplasia have been described as a new cerebellar malformation. The purpose of this study was to assess the association of cerebellar cortical dysplasia with other cerebral malformations. METHODS: We retrospectively reviewed 46 MR examinations of patients presenting with developmental delay, hypotonia, and facial deformities to identify abnormal folia or fissures or both within cerebellar hemispheres or vermis suggesting cortical dysplasia. RESULTS: Cerebellar cortical dysplasia was diagnosed in 17 patients. In two patients, it was isolated. 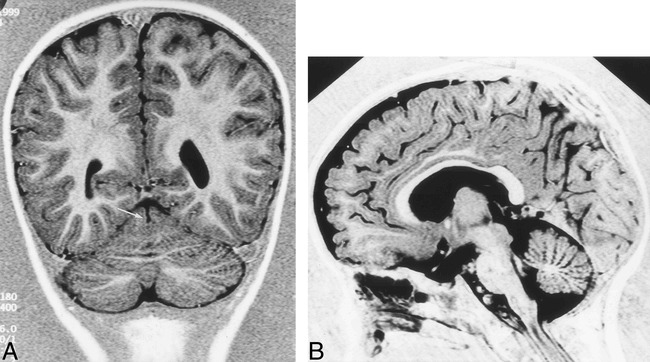 In the remaining 15 patients, the malformation was associated with vermian malformation (n=11), cerebral cortical dysplasias (n=8), dysplasia of corpus callosum (n=6), and heterotopia (n=5). A widespread malformation of the posterior fossa was observed in eight patients (Dandy-Walker, Chiari II and III, and hypoplasia of brain stem). One patient with hypertrophied cerebellar hemisphere had minor enlargement of the right cerebral hemisphere and lateral ventricle. He also had nodular heterotopia, suggesting unilateral megalencephaly. CONCLUSION: Our study suggests that cerebellar cortical dysplasias are common in cases with more widespread cerebral malformations. Technical progress providing high-quality tridimensional MR imaging of the cerebellum may explain its recent descriptions. Focal cerebellar cortical disorganization or dysplasias are often observed in healthy newborns. These findings may be found histiologically in 85% of 147 newborns without other structural abnormalities and may persist during adult life (1). The mechanisms of such dysplasias (their formation and their regression), as well as their influence on appropriate positioning of components of cerebellar cortex, have been previously investigated, but are not clearly understood (2). Moreover, there has been speculation about the contributory role of the cerebellar cortical disorganization to the origin of glial and cerebellar primitive neuroectodermal tumors (2, 3). Different types of cerebellar dysplasias have been described. Rorke et al (1) described the following histologic findings associated with cerebellar dysplasias: compact groups of mature neurons, focal or perivascular immature granular cell collections, mixed cell rests containing both mature neurons and immature granule cells, and heterotopias. All of these findings were located in the deep white matter at the cerebellar midline or in the nodulus of the vermis. Friede (4) described heterotopia and disturbances of cortical layering or folia formation. The reason for their formation may be attributed to a genetic disorder, because they are particularly prominent in infants with trisomies 13–15 and 18 trisomies syndrome (1). Genetic abnormalities could lead to formation of dysplasias because of alteration in the induction of progenitor cell death or the anomalous migration of primitive neural and glial cells. Cortical dysplasias can be isolated or adjacent to a local defect. They also may be found in cases of more widespread neurologic disease, such as congenital muscular dystrophies and oculocerebral syndromes, as well as in various genetic disorders and granulomatosis meningoencephalitis. Hypomyelination and polymicrogyria are associated with variable degree of hypoplasia of the pons and cerebellar polymicrogyria or atrophy in congenital muscular dystrophies (5). In many genetic disorders, the most common findings include pons or cerebellar hypoplasia or both, structural changes of the vermis, and cerebellar progressive atrophy (6). Finally, meningeal infectious damage in the fetus can lead to cortical developmental abnormalities, cystic cerebellar lesions, and polymicrogyria (4, 7). The inclusion of diffuse hypertrophy of cerebellar cortex (Lhermitte-Duclos) within cerebellar dysplasia is debatable because of its histologic features (4). Only one case of isolated cerebellar cortical dysplasia has been described previously (8). In the present report, we describe MR imaging findings of cerebellar cortical dysplasia in 17 cases with neither muscular dystrophy nor metabolic disease. The purpose of this study was to determine the association of cerebellar cortical dysplasia with other cerebral malformations. We retrospectively reviewed all MR images of the brain obtained from pediatric patients in our hospital during the last 3 years. Forty-six patients in whom posterior fossa malformation had been identified were selected (age range, 10 days–14 years). The clinical indications for the MR study of these patients had been developmental delay, cerebellar syndrome, facial or skeletal deformities, and cerebral malformations diagnosed on the basis of CT findings. Further clinical, metabolic, and genetic investigations were conducted with all selected patients. Metabolic and genetic diseases were investigated in cases of unclear diagnosis. Investigations included amino acid and organic aciduria chromatography and carnitine, esterified carnitine, and creatine kinase dosages. Genetic testing included 400- to 600-band karyotyping. MR images were acquired with a 1.5-T unit (Siemens, Erlangen, Germany). For each subject, the following series of images were acquired. First, axial, sagittal, and coronal slices were acquired using a spin-echo T2-weighted sequence (sections thickness, 5, 3, 4 mm, respectively). The acquisition parameters were 5000/120/2 (TR/TE/excitations), a 20- to 25-cm field of view and a 300 × 512 matrix. After that, an inversion-recovery sequence was acquired in one or two orthogonal plans, depending on the location of the abnormalities diagnosed in previous sequences. In this sequence, the parameters were 11520/400/60/2 (TR/TI/TE/excitations), a 20- to 25-cm field of view and a 198 × 512 matrix. The same sequence parameters were used for all the patients and the total scanning time was about 20 minutes per patient. MR imaging findings of these patients were analyzed to determine the frequency of cortical cerebellar dysplasia. Images were evaluated by two neuroradiologists who were blinded to the clinical presentation to ascertain abnormal morphologic characteristics or orientation of fissures and folia within cerebellar hemispheres or vermis, irregularity of the gray/white matter junction, cystlike inclusions and hypertrophied, or hypoplasic cerebellar hemispheres. These malformations were found in 17 patients, and their clinical aspects and MR imaging findings are summarized in Tables 1 and 2. We determined specific characteristics of cortical dysplasias, which can differentiate them from more extensive syndromes such as Dandy-Walker malformation, Joubert syndrome, tectocerebellar dysraphia, or rhombencephalosynapsis. Association with other hemispheric malformations such as heterotopia, corpus callosum dysplasia, abnormal cortical gyration, and white matter abnormalities were also investigated. In 17 patients, we found a high incidence of developmental delay, hypotonia, facial deformities, and abnormalities in eyes or in ocular motricity. In most cases of developmental delay, patients were severely affected with both cognitive and motor delay. Facial deformities included pro- and retroprognathism, enophtalmos, low-set ears, thin lips, and nose deformations. No midline facial clefts were found. Other frequent clinical presentations were strabismus, nystagmus or abnormal eye movements, and skeletal deformities, most frequently found in fingers with brachydactyly and clinodactyly. According to the results of metabolic and genetic tests, no congenital muscular dystrophy was present in our patients. Chromosomal anomalies (45X/46XiXq and SD haploX) were diagnosed in only one patient (case 5). One patient presented congenital toxoplasmosis (case 13). On the other hand, a posterior fossa tumor was found in one patient (ganglioneuroma) (case 11). Dysplastic abnormalities of cerebellar cortex were observed in 17 patients. In eight patients, we identified vertically orientated folia in cerebellar hemispheres (Fig 1). No foliation or defective foliation of cerebellar cortex or disorganized cortical architecture without a well-delimited gray/white matter junction (Fig 2) was observed in 10 patients, and cystlike inclusions (Fig 3) were found in three. These findings were associated with diffuse enlargement of the cerebellar hemisphere (Fig 4) in one case, and with thickening of the cerebellar cortex (Fig 5) in another case. Irregular gray/white matter junction (Fig 6) was seen in two cases and abnormal vertical fissures of the vermis (Fig 7) were seen in eight patients, leading to abnormal foliation in one (case 17) (Fig 7b). Dysplasia was isolated in two patients (cases 13 and 17). The remaining 15 patients had other cerebral mal-formations. Patient 15, Dandy-Walker complex. Axial inversion-recovery (IR) T1-weighted image (11520/60/400/2 [TR/TE/TI/excitations]) shows bilateral, vertical, orientated folia of the cerebellar cortex associated with an enlarged fourth ventricle. Patient 8, possible Joubert malformation. A, Coronal IR T1-weighted image (11520/60/400/2) shows rostral vermian dysgenesis (black arrowhead), bilateral abnormal arborization of the white matter (double black arrowhead), and linear heterotopia (white arrow). B, Axial T2-weighted image (5000/120/2 [TR/TE/excitations]) shows vermian dysgenesis (short arrow) associated with mega cisterna magna and prominent appearance of the superior cerebellar peduncles (long arrow). Patient 4. A, Axial IR T1-weighted image (11520/60/400/2) shows right cerebellar hypertrophy with vertical folia in an 8-year-old boy with ataxia and psychomotor retardation. B, Coronal T2-weighted image (5000/120/2) shows associated malformations: minor parietal lobe (double arrow) and ventricle enlargement, nodular heterotopia (long arrow) and white matter hyperintensity (short arrows). Patient 16. MR imaging findings in a 4-year-old boy with microcephalia, motor delay, and facial deformities. A, Coronal IR T1-weighted image (11520/60/400/2) shows bilateral cerebellar defective foliation and irregularity of the gray/white matter junction (black arrowheads). Note subependymal heterotopia along the floor of the left temporal horn (white arrow). B, Coronal IR T1-weighted images (11520/60/400/2) shows heterotopia (white arrow) and associated cortical dysplasia of parahippocampal gyrus (asterisk). Patient 17. MR imaging findings in a 1 year-old boy with facial deformities, hypotonia, and developmental delay. A, Coronal IR T1-weighted image (11520/60/400/2) shows medial vermian fissure (arrow). B, Sagittal IR T1-weighted image (same parameters) shows lack of normal fissures of the vermis associated with inferior vermis hypoplasia. The most frequent associated malformation was a vermian malformation (agenesia, hypoplasia, dysplasia, and atrophy) observed in 13 patients (cases 1, 9, 12, 14, 15, 17). Cerebral cortical dysplasia with irregular gray/white matter junction or polymicrogyria was seen in eight patients (cases 1, 2, 4, 5, 7, 10, 12, 14). Other associated malformations included: dysplasia of the corpus callosum in six patients (corpus callosum was absent in one patient [case 7], hypoplasic in one [case 8], thinned and shortened in three patients [cases 2, 9, 12], and thinned in two [cases 14, 15]); heterotopia in six patients (subependymal in four patients [cases 2, 4, 14, 16] and nodular within centrum ovale in two [cases 6, 9]); and posterior fossa malformation in eight patients (Dandy-Walker syndrome with severe vermian hypoplasia and hydrocephaly [case 3] and with moderate inferior vermian hypoplasia and ventriculomegaly [case 15], Chiari II [case 2] and Chiari III [case 12] malformation, and hypoplasia of brain stem [cases 1, 7, 10, 12]. Patient 4 had minor enlargement of the right parietal and occipital lobes and lateral ventricle associated with subependymal heterotopia and patchy hyperintensity within white matter. These features may suggest unilateral megalenchephaly (Fig 4). In newborns, minor cerebellar dysplasias are found histologically in the white matter and nodulus of the vermis. These midline cerebellar dysplasias are common features of human cerebellar development (2). Major cortical cerebellar dysplasias, however, represent a pathologic finding. They have been reported in congenital muscular dystrophies and related syndromes or in intrauterine infection (8–14). Only one case of isolated cerebellar cortical dysplasias has been described (8). Based on neuroimaging findings of cerebral abnormalities, our study showed that cerebellar cortical dysplasia may be associated with widespread cerebral malformations and cases with isolated cerebellar abnormalities are rare. They are associated with a poor prognosis and severe neurocognitive defects, with global or motor developmental delay, hypotonia, oculomotor disease, and facial and skeletal deformities. The most relevant MR appearance of cerebellar cortex in these patients included: defective, large, or vertical fissures; irregular gray/white matter junction; lack of normal arborization of the white matter; and heterotopia within cerebellar hemispheres, all findings leading to disorganized foliation. Vertical abnormal fissures in vermis are also present and in sagittal images its presence is shown as an abnormal foliation of vermian lobules. Other radiologic findings were cortical thickening, hemispheric hypertrophy, and cystlike cortical inclusions. No patient in our study had metabolic or congenital muscular dystrophy (CMD) disease. Nevertheless, the radiologic aspect of CMD described by Barkovich (5) was present in four patients (cases 1, 4, 5, 10), including white matter abnormalities associated with cortical supratentorial dysplasia and cystlike cortical abnormalities of cerebellar white matter (patient 1 and 10). 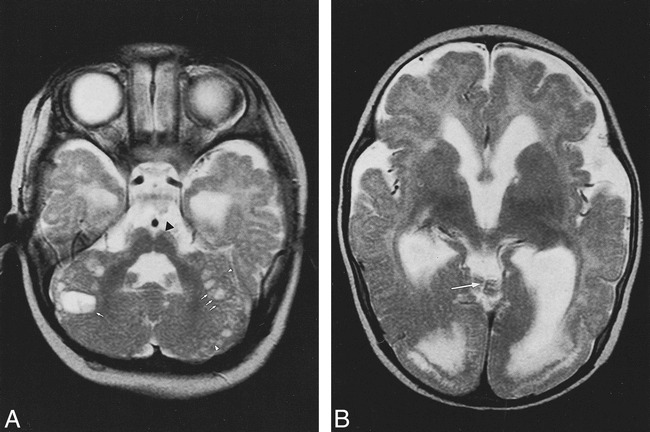 Cystlike cortical abnormalities have been also reported in Fukuyama disease. These abnormalities may represent subarachnoid spaces engulfed by the fusion of disorganized folia (12). In cases of isolated cortical cerebellar dysplasia, Demaerel et al (8) suggested that cystic inclusions represent sequelae of the migration of neurons, which form the external granular layer of cerebellar cortex at 11 to 13 weeks of gestation, or remnants of daughter cells, which migrate to form part of the outer molecular layer and inner granular layer at 16 weeks. The understanding of cerebellar cortical dysplasia is facilitated by knowledge of cerebellar cortical development. Cerebellar cortical neurons have a dual origin. Up to about 10 weeks of gestation, the neural cells that will form the deep nuclei and the Purkinje layer of cerebellar cortex migrate radially outward from the germinal matrix. In contrast, at approximately 10 to 11 weeks, the neurons that will form the granular layer migrate tangentially over the cerebellar surface (15). The early signs of foliation, which manifest prior to the formation of a fissure, are a local increase in premigratory granular cells and an indentation of the Purkinje cell layer. Up to the 40th week, the cerebellar lamellae are made up of four layers: the external granular layer, the molecular layer, the Purkinje cell layer, and the internal granular layer. During the first 6 to 8 months of extrauterine life, the external granular layer subsides progressively as its cells migrate inward and the cerebellar lamellae assume their adult appearance with only three layers (16). The external granular layer, Purkinje cell layer, and the overlaying meningeal cells may be involved in the mechanism of foliation (17). Immunohistochemical observations described in the developed mutant rat with cerebellar malformations have shown that the cerebellar lamination is disturbed by abnormal perivascular aggregations of the external granule cells (EGCs). The abnormal aggregation of EGCs is preceded by an aberrant migration and misorientation of Purkinje cells in the hemispheres and a disturbed arrangement of glial fibers, suggesting that Purkinje cell settlement may be a key in cerebellar development. Moreover, a close relationship between defective development of the cerebellar vermis and cerebellar dysplasia is present. These findings have also been described in human cerebellar cortical dysplasia (2, 18). The stage during which the perivascular aggregations of EGCs are found in the rat corresponds to human gestation at 24 to 27 weeks (19). According to these reports, mutation of a gene expressed in cerebellar development (17) or congenital infection, toxins, or radiation (15) are different causes affecting migration and proliferation in cerebellum, leading to vermian and cerebellar dysplasia and hypoplasia. These findings were present in 11 of our patients. Nevertheless, only one had chromosomal abnormalities and another patient had congenital infection. In one patient, cerebellar dysplasia was continuous as well as contiguous to a posterior fossa tumor. Jay (3) has previously described this association. There was disorganization of the cortex, with fusion of folia, disorganization and misorientation of Purkinje cells, and irregularly oriented and tangled radial glialike processes, suggesting a role for abnormality of radial glia in the pathogenesis of the lesion. The authors proposed a possible pathogenetic association between cortical dysplasia and development of the tumor. Cortical dysplasia was considered to be an aberrant neuronal migration or maturation, and its presence contiguous to the tumor suggested that the tumor arose as an abnormal genetic control in the migration and differentiation of neuronal precursors. Our MR imaging findings showed that dysplasia was frequently associated with other malformations. 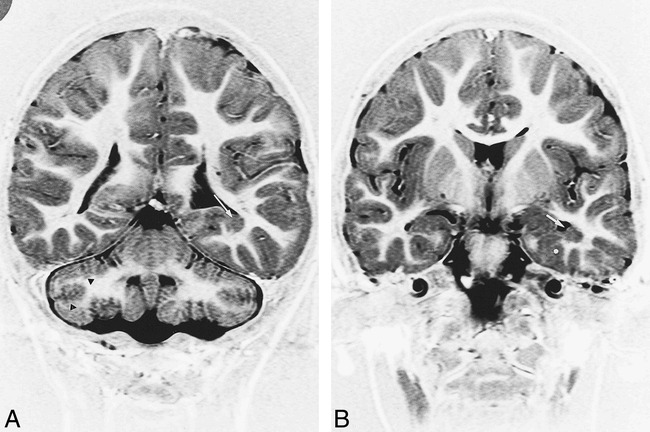 Few cases of isolated unilateral cerebellar cortical dysplasias have been described. Demaerel et al (8) reported one case with bilateral cerebellar dysplasia. MR imaging characteristics were defective or vertically oriented foliation, frequently associated with vermian dysplasia. In our study, only two patients had isolated bilateral cerebellar cortical dysplasia. Cerebellar cortex presented vertically oriented or defective folia. In these patients, cerebellar dysplasia was isolated; however, in one patient, a congenital toxoplasmosis was diagnosed. Seven patients had unilateral disorganized cortical components of cerebellar hemisphere. In these cases, cortical unilateral dysplasia was always associated with other cerebral malformations. Among patients with adjacent focal or widespread cerebral lesions, our findings concurred with previous reports. In two patients, however, MR imaging findings were unusual and consisted of an enlargement of the cerebellar cortex in one patient (case 5) and a hypertrophied cerebellar hemisphere in another (case 4). Unusual malformations of cerebellum have been previously described (eg, hamartoma associated with cerebral atrophy , macrocerebellum associated with delayed myelinisation , hemimegalenchephaly with cerebellar involvement , and cerebellar monstrous hypertrophy ). The features of these cases do not resemble those of our patients. In our study, hypertrophied cerebellar hemisphere was dysplastic without cerebral atrophy or delayed myelination. Two patients had cerebellar white matter abnormalities, but one of them had also congenital toxoplasmosis. Finally, another new cerebellar malformation was recently reported with a partial midline fusion of the cerebellar hemispheres (17), and Demarel et al (24) described vermian changes with associated cerebellar abnormalities. In these cases, vertical folia and abnormal fissures were associated with defective foliation. Our findings are distinct from these descriptions. Fusion of the cerebellar hemisphere was not associated with cortical dysplasia, vermian dysplasia was always associated with cerebellar abnormalities, and dysplasia was associated with cerebral malformations in 15 of 17 cases. As previously described, when cortical dysplasia was associated with polymicrogyria and other associated malformations, cerebellar abnormalities may have represented not only a single entity, but a spectrum of more extensive morphologic changes (8). Further research is in progress by our group to explain what symptoms were attributable to the cerebellar malformation in our patients. Investigations are also indicated to understand the association among cerebellar cortical dysplasias, minor facial anomalies, and hand-skeletal deformities with supratentorial malformations. Indeed, abnormalities of the expression of the homeobox genes could lead to the development of malformations of the cerebellum, basal forebrain and visual system, mandibular and maxillary arch patterning, and finger skeletal anomalies (25). In conclusion, cerebellar cortical dysplasias may result from different causes, both genetic and acquired. They have been reported in congenital muscular dystrophies and related syndromes or in intrauterine infection. The most common features seem to be the vertically orientated folia instead of the normal horizontal folia pattern, disorganized foliation, and defective or abnormal fissures. In most cases, cerebellar cortical dysplasia is associated with other cerebral malformations and immunohistological findings suggest that abnormal cell migration caused by a disorder in early gestation result in cerebellar dysplasia. A genetic effect responsible for the human vermis defect and cerebellar dysplasia has not been identified yet. Our study suggests that cerebellar cortical dysplasia is a common feature in cases with widespread cerebral malformations and this can be related to the technical advances providing high-quality tridimensional MR imaging of the cerebellum in a period of renewed and widespread interest in the cerebellar involvement in cognitive processing. We are grateful to Xavier Leclerc and Olivier Godefroy for their review of the manuscript and their valuable comments and to Antoine Drizenco and Frederic Lemarchand for assistance in obtaining the MR images. ↵1 Address reprint requests to Gustavo Soto-Ares, Departement of Neuroradiology, Hôpital Roger Salengro, Chru Lille 59037 Lille—France. Accepted after revision March 1, 2000.